Savvy Spending: Toys R Us: Free $25 gift card with your purchase of $100 or more, through 10/31! Toys R Us: Free $25 gift card with your purchase of $100 or more, through 10/31! If you're starting your Christmas Shopping, check out this deal! 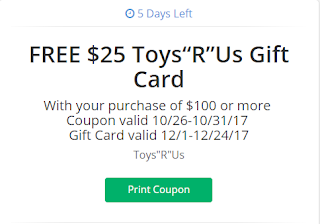 Now through October 31st, you can print a coupon for a FREE $25 ToysRUs Gift Card with your purchase of $100 or more. Your free gift card can be redeemed December 1st – 24th and is valid on select items (exclusions apply so be sure to read the fine print).